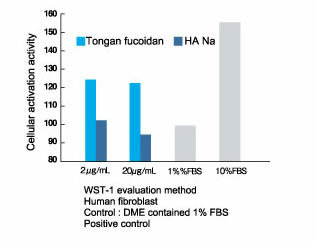 By using WST-1 evaluation method, Tongan Fucoidan 1% was recognized the significant predominance of human fibroblasts by comparison of HA Na. By eliminating oxygen experiment　which was measured in comparable terms of the same concentration, it was confirmed that Tongan Fucoidan has 6 times more antioxidant activity than Bio HA Na. Skin moisture retention value was measured with 2 women(average age 35.4) and 3 men (average age 26-58) under the conditions of ordinary temperatures and humidity. In 15 minutes, it was confirmed that Skin moisture retention value of 1% Tongan Fucoidan aqueous solution doubled as high as water. Moisture retention value of water was dropped down in the meantime, to the contrary, value of 1% Tongan Fucoidan aqueous solution was kept. 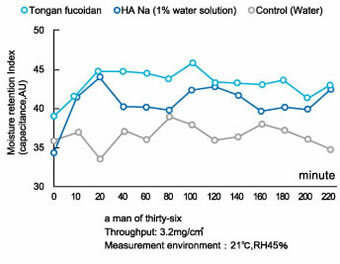 We have conducted a comparison of moisturizing effect between Fucoidan and HA(hyaluronic acid) Na 1% water solution with a man aged 36 years old under the conditions of ordinary temperatures and humidity over time. In the first 10 minutes, they both showed the nearly equal moisture retention value. However the value of HA 1% water solution dropped and the value of Tongan Fucoidan 1% water solution was maintained at the same level in the meantime. 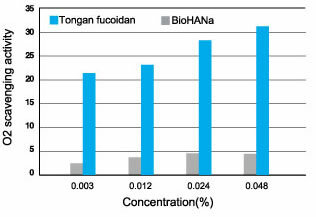 It is evidently identified that the viscosity degree of Tongan Fucoidan 1% water solution was high compared with others. It results commonly from high molecular(polymeric) Fucoidan.As for appearance comparison, Tongan Fucoidan 1% water solution was clear and a transparent color, whereas the other 1% water solution was brownish yellow or blackish brown. It is also proved(confirmed) that brownish color smells stronger in terms of odor comparison. According to a comparison of molecular weight difference, Tongan Fucoidan of high molecular weight has a notable evidence of superiority of water retention ability, moisturizing activity and skin elasticity,: which are criteria requirements of beautiful skin effect : over others.